Often translated as 'the art of remaining unseen', Ninjutsu has a long history, and is probably the most renowned and misunderstood of all martial arts. Ninjutsu continues to thrive as an active school of martial art, and the Ninja as black-clad 'super spy', combat master, and secrecy expert continues to hold power over the imagination. However, the history of Ninjutsu is often murky, its origins surrounded by mystery and legend. Here, for the first time, is an in-depth, factual look at the entire art of Ninjutsu, including the emergence of the Ninja warriors and philosophy in feudal Japan; detailed historical events; its context in the development of other schools of martial arts; and, the philosophies and exercises of the school today. 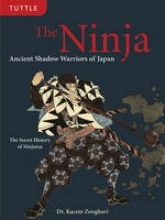 Based on more than 10 years of study and translation of authentic Japanese texts, including many that have never before been translated, this is the most comprehensive and accurate study of the art of Ninjitsu ever written outside of Japan. It dispels the falsehoods, details what information can and cannot be proven historically, and reveals new information, much of which contradicts commonly accepted knowledge. For those who train in Ninjutsu, for other martial arts practitioners, for historians, and for anyone with an interest in Japanese feudal interest, "Ninja" shines a light on this enigmatic subject.